MASERU – Tgee Modelling Agency commemorated Moshoeshoe’s Day by hosting a fashion show in honour of Basotho culture on Saturday, March 16 at ’Manthabiseng Convention Centre. Designers brought cultural designs to the show to relive Basotho traditions. Up to 31 models, 11 of whom were male, entered the room filled with noise of cheerful audience, showcased incredible moves in their amazing outfits. The audience were all-ecstatic to witness the magnificent designs with very stunning local models. Designers Avant Cee Elle, Mabeile Malatiana and Haka productions graced the event which was sponsored by the likes of Print Corp, Maloti Plumbing, Advanced Creative, as well as Obri the filmmaker. Tgee Modeling, which organised the celebration of Moshoeshoe’s Day Fashion Show, seeks to boost self-esteem among models and help them see modelling as a defined career. The agency holds a similar fashion show annually to celebrate Basotho heritage. Thato Fonya, Tgee agency manager, said: “The show hopes to ensure that while we promote culture, we remain abreast with trends”. Local artistes at the fashion show included the likes of Chocolate Soul, Sthola sa Makoera, MAT.E.D and Guzu. The end of the show saw three ordinary people – one men and two women – being chosen for being smartly dressed for Moshoeshoe’s Day. One of the women, ’Malekhotla Mahooe, said she was not expecting to be singled out as the best dressed and she was therefore pleasantly surprised. Mahahabe Philomena Molapo, widely known as Maria Bennett in dance circles, was also nominated as one of the best dressed. “After being chosen, I felt intrigued because I didn’t expect to have my design appreciated by the house at large. The show was way better compared to that of last year. The designs were breathtaking and the crowd was impressed and so was I,” she said. 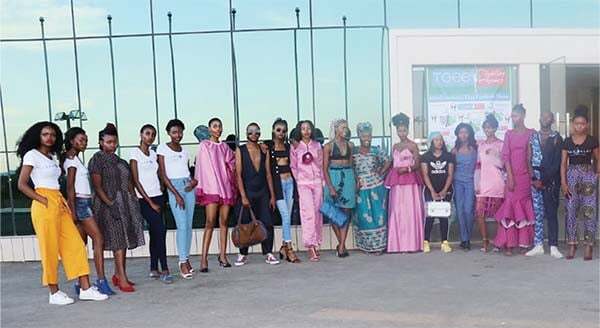 “The aim behind the fashion show is to embrace Basotho culture in a more fashionable manner, transforming Basotho culture and tradition into a modern fashion lifestyle presentation,” Fanya said. He also indicated that their mission is to see modeling being appreciated in Lesotho and to ensure that can they can earn a living through their trade. Relebohile Buti, 22, a student at Limkokwing University, in Maseru who is also a Tgee model said she has always loved modeling, having started on the career in 2015 and signed with Tgee Modeling in 2017. Buti said she is very happy with Tgee Modeling adding that the challenges they meet as models are of people taking advantage of them and deceiving them by promising them “exposure”. Besides that, “Basotho people do not take modelling seriously” she further said. Rets’epile Mohale, 24, also a model, echoed Buti’s sentiments although she acknowledged that she was thrilled by the Moshoeshoe’s Day Fashion Show and noted as models they need support from Basotho. “The support from home can help us grow economically and make us be recognised internationally,” she added. Advanced Creative sponsored the show with blankets. Next Pressure to marry: what are your choices?